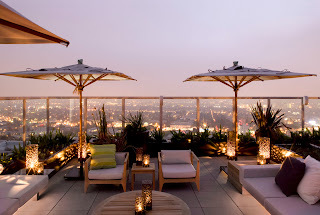 On our recent trip to L.A., we had the chance to tour the Andaz West Hollywood. It was formerly the Hyatt, aka the Riot House which many legendary rockers called home for a night or two. Among the many classic tales of rockers misbehaving: Keith Richards hurled a large TV from his tenth-floor room; Jim Morrison dangled from a window by his fingertips and Axl Rose tossed seared steaks to his many fans below. The hotel even made its way into film–scenes from Almost Famous and This Is Spinal Tap were filmed on property. Today, it’s a chic, modern, affordable hotel, but the rock n’ roll vibe lives on. That’s the stunning view from pool deck, above. (It’s the highest hotel pool deck in all of L.A.) The rooms are sparsely decorated, but not lacking in amenities. Non-alcoholic items from the minibar are free, including cult favorite Pop Chips. We had to take a photo of the stenciled globe. It fits right in with our map fetish. Every rooms gets an orange, stuffed pooch. The RH restaurant was named after the Riot House nickname. It’s manned by chef Sebastien Archambault who has worked with Alain Ducasse. We loved the pool deck so much, we’re throwing in another photo of it at night. A few other things we found charming about the Andaz West Hollywood: The staff gets to pick their own “uniforms” off the rack from local brands like Velvet and Vince and the price–rooms start at under $200!